The Aluzinc cladding steel coil apply hot dip Al-Zn coating on both faces of cold rolled steel of different strength and thickness. In its coating, Al accounts for about 55%, Si 1.6%, others are Zn. 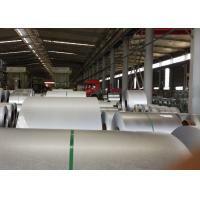 Compared to hot dip galvanize steel , galvalume steel has better anti-corrosion ability. Fingerprint resistant oil also make its service life longer. 3 Grade: SGLCC CSB G1 DX51D etc. Chemical Treatment and Oil The chemical treatment provides very good protection against humid-storage staining, while the oil provides lubricity for operations. Dry must be transported and stored with special precautions to preserve low-humidity conditions.